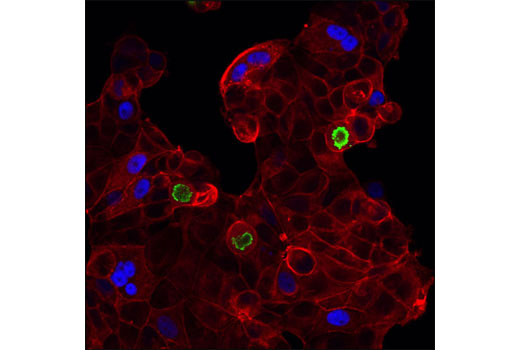 Confocal immunofluorescent analysis of MCF7 cells using p21 Waf1/Cip1 (12D1) Rabbit mAb (Alexa Fluor® 647 Conjugate) (blue pseudocolor) and Phospho-Histone H3 (Ser10) (D2C8) XP® Rabbit mAb (Alexa Fluor® 488 Conjugate) #3465 (green). Actin filaments were labeled with DY-544 phalloidin (red). Flow cytometric analysis of MCF7 cells using p21 Waf1/Cip1 (12D1) Rabbit mAb (Alexa Fluor® 647 Conjugate) versus Hoechst (DNA content). 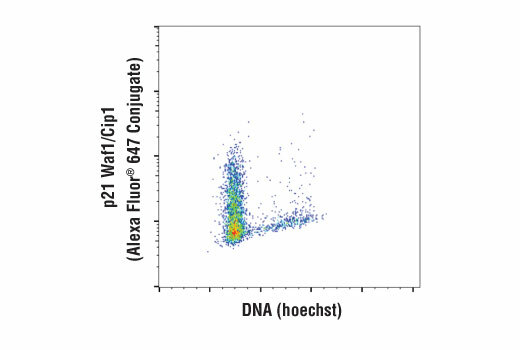 p21 Waf1/Cip1 (12D1) Rabbit mAb (Alexa Fluor® 647 Conjugate) detects endogenous levels of total p21 protein. The antibody does not cross-react with other CDK inhibitors. Monoclonal antibody is produced by immunizing animals with a synthetic peptide corresponding to residues near the carboxy terminus of human p21 protein. This Cell Signaling Technology antibody is conjugated to Alexa Fluor® 647 fluorescent dye and tested in-house for direct flow cytometry and immunofluorescent analysis in human cells. The antibody is expected to exhibit the same species cross-reactivity as the unconjugated p21 Waf1/Cip1 (12D1) Rabbit mAb #2947. The tumor suppressor protein p21 Waf1/Cip1 acts as an inhibitor of cell cycle progression. It functions in stoichiometric relationships forming heterotrimeric complexes with cyclins and cyclin-dependent kinases. In association with CDK2 complexes, it serves to inhibit kinase activity and block progression through G1/S (1). However, p21 may also enhance assembly and activity in complexes of CDK4 or CDK6 and cyclin D (2). The carboxy-terminal region of p21 is sufficient to bind and inhibit PCNA, a subunit of DNA polymerase, and may coordinate DNA replication with cell cycle progression (3). Upon UV damage or during cell cycle stages when cdc2/cyclin B or CDK2/cyclin A are active, p53 is phosphorylated and upregulates p21 transcription via a p53-responsive element (4). Protein levels of p21 are downregulated through ubiquitination and proteasomal degradation (5). Pestell, R.G. et al. (1999) Endocr Rev 20, 501-34. Cheng, M. et al. (1999) EMBO J 18, 1571-83. Flores-Rozas, H. et al. (1994) Proc Natl Acad Sci U S A 91, 8655-9. Wang, Y. and Prives, C. (1995) Nature 376, 88-91. Sheaff, R.J. et al. (2000) Mol Cell 5, 403-10.